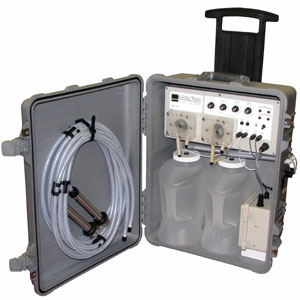 The WS755 wastewater/stormwater sampler's state of the art controller gives you complete control over your wastewater/stormwater sampling process. With the wastewater/stormwater sampler's sample size control, you can take individual time-weighted composite samples or full-bottle discrete grab samples. 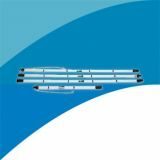 The wastewater/stormwater sampler's sample interval control allows you set the time between individual composite samples or enable the external trigger mode. A start delay timer allows you to start multiple wastewater/stormwater samplers in the field at the same time, or to delay drawing a wastewater/stormwater sample after a triggering event so that your sample better represents the water source. An automatic 15 second backflush cycle clears any debris from the wastewater/stormwater sampler's strainer and empties the water from the hose so the next sample is not contaminated. A unique feature of the WS755 stormwater/wastewater samplers is the ability to set the sampling mode for each pump and bottle individually. This allows you to take two individual time-weighted or flow proportional composite samples, or you can set the stormwater/wastewater samplers to take full-bottle discrete (grab) samples, or you can set them to take a full-bottle discrete (grab) sample in one bottle and a time-weighted or flow proportional composite sample in the other. In the case of two composite samples you can have different size settings for each pump. The stormwater/wastewater water sampler's rugged rainproof enclosure can be padlocked and/or chained to prevent tampering. 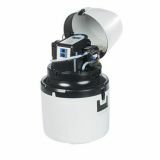 The stormwater/wastewater samplers are enclosed in a case that can be easily hidden or camouflaged to prevent vandalism. The samplers are lightweight enough that even with a full sample bottle the stormwater/wastewater samplers can be suspended, from the over-molded handle on top, in a manhole or tree. The compact enclosure features heavy duty polyurethane wheels and a retractable extension handle for easy transportation. The pickup hoses come with quick disconnect fittings which allows them to be disconnected from the stormwater/wastewater sampler and conveniently stored inside the enclosure when being moved or when not in use. The wastewater/stormwater sampler's 5 AH rechargeable battery will power the sampler for several months or several sampling events. The sealed gel-cell battery and BC100 smart charge controller are contained in a separate battery box inside the wastewater/stormwater sampler's main enclosure to isolate and protect electrical connections. The included smart charger prevents overcharging and greatly extends battery life over other charging methods. Optional AC and solar panel charging options are available, see the Wastewater/Stormwater Samplers Options & Prices section for more information. Attach the AD200 Autodialer or CVD-2000P Cellular Autodialer to your wastewater/stormwater sampler to add remote sample notification. This accessory will save you travel time by ensuring that you always know when your wastewater/stormwater samplers have taken a sample at your monitoring sites. The WS755 improved wastewater/stormwater samplers come with two 1-gallon polyethylene sample bottles for collecting composite samples, two peristaltic sampling pump, a circuit board controller, and a rechargeable gel cell battery. Also provided are two sample pickup hoses and a battery charger. Everything you need is provided for a successful wastewater management or environmental monitoring program.